More is known of the location and density of English settlements in the period from c.AD700-1100 through metal-detecting activity than from archaeological fieldwork, and its interpretation is vital if we are to understand more of landscape, economy and identity in the period. VASLE is a major archaeological project funded by the Arts and Humanities Research Council (AHRC) which has been running at the University of York since October 2004 and will be completed in late 2007. 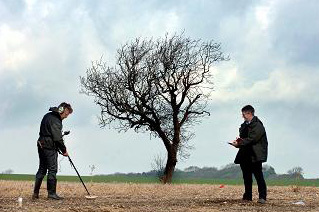 The focus of VASLE is to analyse and interpret the wealth of data found through activities such as metal-detecting, against those found through more traditional archaeological methods. The project encompasses England and Wales, and is evaluating the nature of metal-detected data and how this can be related to settlements of the early medieval period; providing a framework to identify different site types through their metalwork and coinage assemblages; studying site development and morphology; and charting ethnic identity and change and economic development.